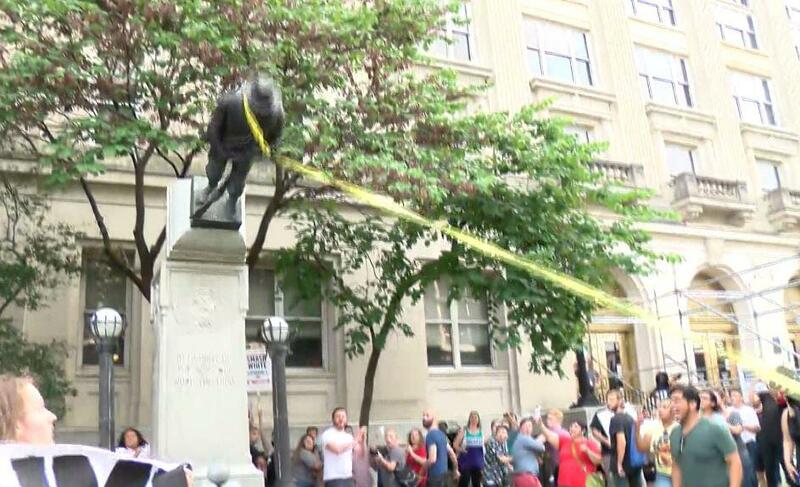 DURHAM, N.C. -- A total of eight people now face charges in connection with the toppling of a Confederate statue in front of the old Durham County courthouse Monday evening, reports CBS affiliate WNCN-TV. But many others lined up at the sheriff's office to turn themselves in as a kind of protest. The statue was toppled Monday during a protest in response to violence and a death at a white supremacist rally in Charlottesville, Virginia, over the weekend. Twenty-year-old James Alex Fields Jr. is accused of aiming is car at a crowd demonstrating against the white supremacist rally on Saturday, injuring 19 and killing 32-year-old Heather Heyer. Three of the eight in the North Carolina case were in court Thursday -- Dante Emmanuel Strobino, 35, Ngoc Loan Tran, 24, and Peter Gilbert, 39, all of Durham. Takiyah Thompson, 22, of Durham, was the first person charged in the incident. Four more protesters were arrested Thursday morning -- Raul Jimenez, 26, Aaron Caldwell, 24, and Elena Everett, 37, all of Durham, and Taylor Cook, 24. Jimenez, Caldwell and Everett were reportedly charged with felony riot and three misdemeanors. They have all bonded out of jail and are all expected to be in court Friday morning. Authorities have not released the charges that Cook is facing. Everett said she didn't mind that she's facing felony charges for participating in the action. "If I am a part of the Durham community and taking down the Confederate statue then I hope that I've played a role in history and I think a lot of people here feel that way," she said. While removing a Confederate statue has been a public statement for many, Caldwell told the station it's personal for him. "I have an ancestor of mine that was a grand dragon of the Klan, and to me it's very important to see these monuments taken down. It's empowering, I feel like if the government isn't willing to do themselves, then people need to take control," he said. Before Strobino, Tran and Gilbert appeared before a judge Thursday morning, a group of protesters rallied outside the courthouse to protest the charges. After the rally, some of the protesters went to the detention center to turn themselves in. Deputies turned away most of protesters who were not there on Monday but wanted to turn themselves in in solidarity with those who were. They were turned away because they had no warrants out for their arrest, officials said. Officials with the group said Durham County deputies are "waging a campaign of intimidation against racial justice organizers." Those leading the rally said they want all charges dropped and they want to stand up against white supremacy. "We're innocent. We demand the charges be dropped. The county and the district attorney should do the right thing and drop the charges," Strobino said Wednesday following his release from jail. The group who gathered outside the courthouse attempted to support Strobino, Tran and Gilbert in court, but deputies kept them out of the courtroom for safety reasons. "Our community, Durham, is being targeted for our resistance, for our organizing, but we refuse to stand down. We'll continue to fight. We'll continue to fight to tear down all of these statues, to tear down white supremacy," Tran said on Wednesday. Durham City Councilman Charlie Reese told WNCN-TV that he agreed that the felony charges were unwarranted and that the statues should go. Reese said that although he disagrees with some of that the sheriff's office is doing, he appreciates how they handled the events Monday. "Despite whatever disagreements with the sheriff about how he chose to charge these individuals, I truly respect and appreciate the way that his deputies and our police officers handled the situation Monday night," he said. The toppled statue is currently in the possession of Durham County and it is now entered as evidence in connection with the charges. Durham County will reportedly engage the state regarding how to move forward with the restoration or removal of the statue. "The Sheriff's Office supports the right to peaceable assembly. As the custodian of the courthouse, the safety and security of visitors and employees will remain a top priority for the Sheriff's Office. We have taken steps to ensure the daily operation of the courthouse can proceed without disruption. I expect participants in the planned rally to obtain a permit and engage in a peaceful demonstration. My Agency will continue to maintain the safety and security of the building." Protesters are expected to be back out at the Durham County Courthouse Friday morning before Jimenez, Caldwell, Cook and Everett make their first appearances. The Durham County Sheriff's Office said they expect additional arrests in the case.